This is my first post as a new contributor to Particlebites. Here’s a little bite about me: I’m an experimental particle physicist working at the University of Mainz in Germany as a postdoctoral researcher. I work on the ATLAS experiment at CERN and have for the past 6 years or so. (I’ll fill out my bio soon). This has been a really exciting time to be a particle physicist! Only a year ago the Higgs was discovered at the LHC, and just a few weeks ago Francois Englert and Peter Higgs won the Nobel prize for their work predicting it’s existence almost 50 years ago. These results are exciting further strengthen the Standard Model. However, my post today is regarding brand new results hot off the press from the Large Underground Xenon (LUX) experiment. The purpose of LUX is to search for WIMP-like dark matter. After 85 days of running, they achieved the world’s highest sensitivity. Unfortunately they didn’t find any excess signal – which also means that the earlier CDMS-Si potential signal is also ruled out. But the potential for discovery is really exciting. The next run will be over 300 days and should further increase the sensitivity by ~5x depending on the cross section. Dark matter is out there… it’s just really good at hiding. And attached is a picture of their exclusion plot (unfortunately they didn’t include a legend on this version – it’s described in the caption in the paper and I’ve included it here). 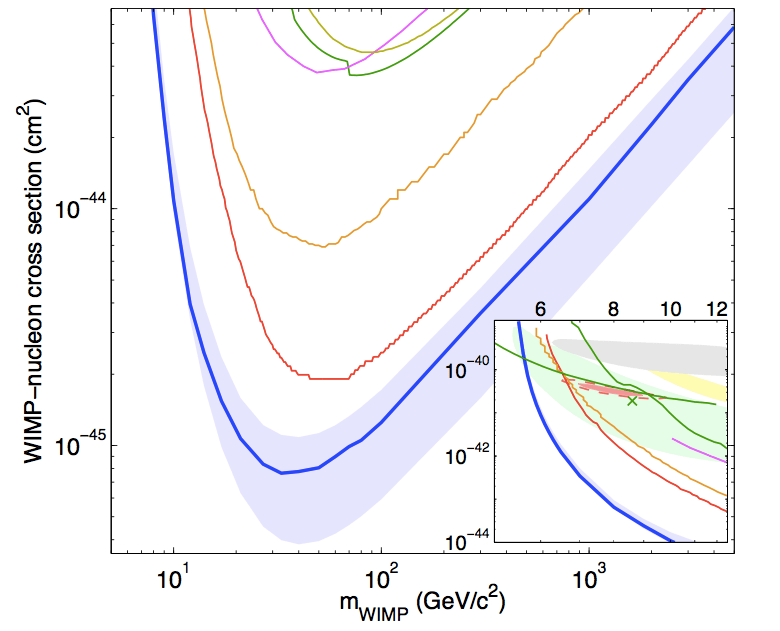 The LUX 90% confidence limit on the spin- independent elastic WIMP-nucleon cross section (blue), together with the ±1σ variation from repeated trials, where trials fluctuating below the expected number of events for zero BG are forced to 2.3 (blue shaded). We also show Edelweiss II (dark yellow line), CDMS II (green line), ZEPLIN-III (magenta line) and XENON100 100 live- day (orange line), and 225 live-day (red line) results. The inset (same axis units) also shows the regions measured from annual modulation in CoGeNT (light red, shaded), along with exclusion limits from low threshold re-analysis of CDMS II data (upper green line), 95% allowed region from CDMS II silicon detectors (green shaded) and centroid (green x), 90% allowed region from CRESST II (yellow shaded) and DAMA/LIBRA allowed region interpreted by (grey shaded). Happy reading! And I hope you enjoy my future posts.